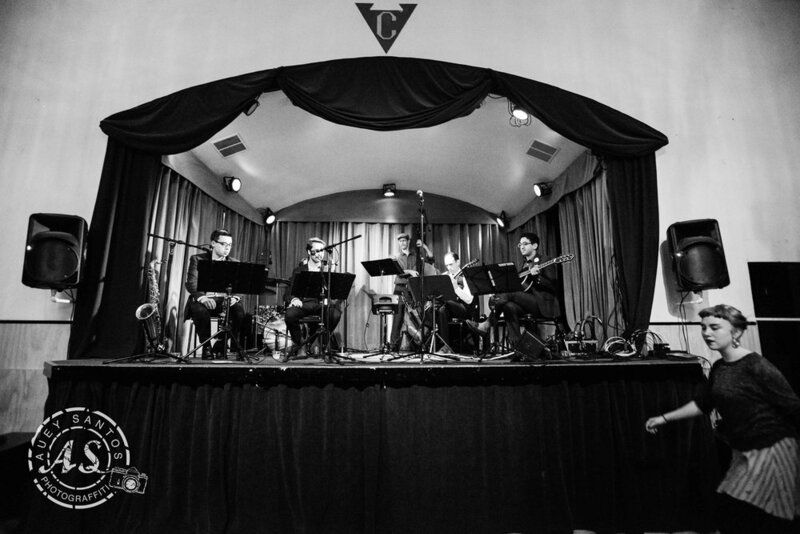 Led by longtime musician and swing dancer Nirav Sanghani, the Pacific Six play tight arrangements of early jazz and swing tunes for dancers and more. Their repertoire includes transcriptions of small group swing recordings by Benny Goodman, Johnny Hodges & Coleman Hawkins, fresh arrangements of well-loved standards, and vintage-inspired originals composed and arranged by Nirav. Since early 2017, the band has been honing their sound in the swing dances of the San Francisco Bay Area, playing at weekly events such as The Breakaway, Shimmytown, Woodchopper's Ball, and Wednesday Night Hop, as well as monthly events like Bal Haus and The Dancers' Den. Nirav Sanghani and the Pacific Six have also begun to bring their authentic but danceable energy to weekend workshops and dance exchanges, including The Switch Workshop and Berkeley Lindy Exchange. The band released their first album in March 2019, featuring original small group swing material alongside adaptations of classics. Purchase a CD at one of their gigs or online. The band recorded their first album in August 19, 2018 and released it on March 26, 2019. It features a mix of originals by Nirav and standards, with an all-star lineup of musicians from San Francisco, Sacramento, Seattle, and Vancouver. Tracks from the album have been featured on 91.1 KCSM’s Breakfast, Dance & Barbecue (Mar 31, 2019) and Hey Mister Jesse (episode #159). Special thanks to Suzanne Van Arsdale, Priti Sanghani, Shijie Lu, Vasu Sanghani, Vikash Sanghani, Kate Stewart, Haggai Nuchi, The 9:20 Special, The Breakaway, and Shimmytown. This album was made possible by their generous support. We respect your privacy and won't use this for anything besides occasionally sending you some stuff about this band.